Somewhere Along the Way is a place to surround yourself with all forms of art, including music and poetry, while enjoying wine, beer, coffee and more. Mark Richardson swears he had his fill of Gainesville in the early 1980s while attending Santa Fe College and playing sousaphone in the UF Marching Band. 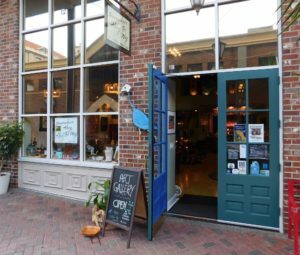 So, why, more than 35 years later, is Richardson back in town and running a funky little art gallery/wine café called Somewhere Along the Way in the heart of downtown Gainesville? Blame his wife, Diana, who couldn’t pass up a plum job opportunity from UF Health/Shands a few years back. The entrance to Somewhere Along the Way. After some arm twisting, however, Richardson eventually caved in. 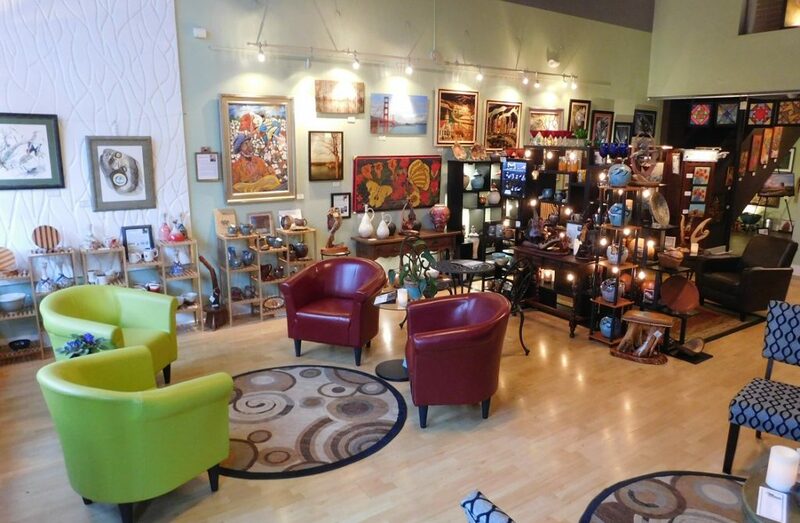 Earlier this year, Richardson, 56, opened Somewhere Along the Way in Union Street Station, on the same block of Southeast 2nd Place that includes the Black C Art Gallery and the Artisans’ Guild Gallery. 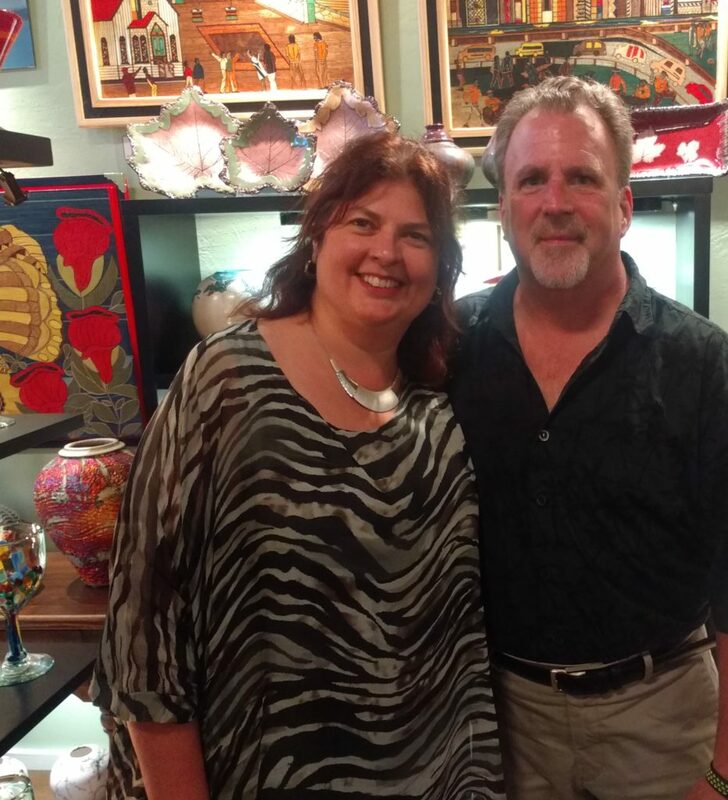 He had opened a similar gallery three years ago on Cholokka Boulevard in Micanopy, but decided downtown Gainesville was a better fit for his business. Somewhere Along the Way features the works of almost 20 regional artists in all mediums, including painting, sculpture, pottery, blown glass, wood, mosaic, photography, poetry and writing. The artwork surrounds several cozy seating areas, where customers can relax and enjoy some wine, beer or coffee in an intimate atmosphere. “Someone said ‘This is Gainesville’s favorite living room,’ and I thought ‘That’s pretty much what I really wanted to capture,'” Richardson said. Somewhere Along the Way is also downtown Gainesville’s newest music venue. In recent months, Richardson has brought in classical guitarists, pianists, poets and the local Americana folk duo Damaged Daughters for regular appearances. Diana and Mark Richardson inside Somewhere Along the Way. On Saturday, the gallery will present the Swan City Jazz Project from 5:30-9 p.m. The trio — Rick Runion (sexophone), Jody Marsh (piano) and Philip Booth (bass) — draws from standards, blues, bossa nova and funk, as well as original compositions. The event is free and open to the public. Although Richardson wants people to come into Somewhere Along the Way and order a drink or two, he wants people to immerse themselves in the art that fills the walls and display cases. 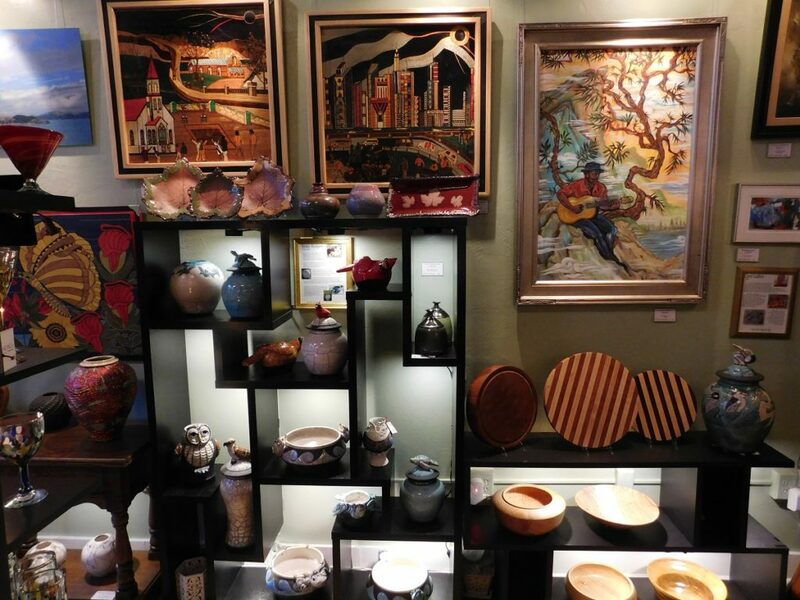 Somewhere Along the Way is a place to relax and experience art, according to owner Mark Richardson. Richardson said the more often people surround themselves with art, the more likely they will be to notice nuances — and perhaps purchase a piece or two. Right now, the challenge for Richardson is drawing people inside. Artwork covers the walls and shelves of Somewhere Along the Way. Then he arrived in Gainesville the first time, earning his AA at Santa Fe then attending (but not graduating from) UF. During those college years, Richardson worked at the Civitan Regional Blood Center, at Shands as an EKG technician and at the old Albertsons grocery store. He also was a member of Sigma Nu fraternity and played sousaphone in the UF Marching Band and saxophone in the jazz band. “When I left Gainesville, I was 21 and ready to do whatever I was going to do,” he said. Richardson moved to Fort Lauderdale with his girlfriend, got married (for the first time) and had his first child. He spent 20 years in Atlanta and then 10 years in the Boston area. He eventually graduated from UMass with an information technology degree. He was working as a senior business analyst for Keurig Green Mountain, Inc., in Boston when UF Health/Shands wooed Diana Richardson as its VP of Operations. Downtown Gainesville was not the only area of town he considered for Somewhere Along the Way. He also looked at Tioga, Thornebrook Village and West University Avenue. More than 30 years after bidding farewell to Gainesville “for good,” now he’s wondering why he ever left. For further info, visit the Somewhere Along the Way website.